to share literacy station ideas! 2. 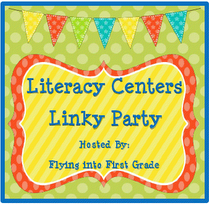 When do you start your literacy centers? I start by giving the class sets of manipulatives to 'play' with - blocks, legos, puzzles, play dough, etc. We talk about appropriate ways to use classroom materials and how to respect the materials and each other. Once everyone has that down (this takes about 3-4 days), I pull a group to teach the first station and guide them as they practice it while the rest of the class works with the manipulatives. The next rotation, I take a different group and repeat. Once one station has been introduced to everyone, I pull a group of kids and teach them the second station, while another group works in the first station , and the rest of the kids are at their tables with manipulatives. Is that too confusing!? This pattern continues until all stations have been introduced and practiced. I usually introduce 2 stations each week, although that's probably rushing it a little. Jan Richardson spells it out so nicely in her book. Modeling and practice! Show the students what you expect from a station and allow them guided practice with the teacher's supervision. If they practice in the station without any guidance, they will probably move away from the expectations and form bad habits. Once everyone has gotten a chance to experience a station (and this may take a few days), bring the kids together as a group to discuss it. What does productive work in this station look like? What does it sound like? What does it feel like? These are great to put on an anchor chart for the kids to have up as a reference. I never assume they know what to do. I make sure I teach every procedure I need them to follow. This year I would love to try to include photos of what a tidy station looks like and photos of kids working well in a station! I really like to make the rotation part of Literacy Stations simple enough that I don't have to do anything during transitions and I don't have to change a bunch of cards around on a chart each day, so I use a wheel system. The kids know exactly what to do and where to go so the transition is quick and smooth (usually!) You can read more about how I use the wheel HERE. Good literacy stations really determine whether or not the teacher will be able to effectively teach small group guided reading without interruption. And we certainly don't want our kids doing busywork during that time, either, so it's worth it to put in the time up front and get those stations running smoothly! Thanks, Mrs. Reed for a great linky idea! I'm looking forward to reading what everyone has to say! 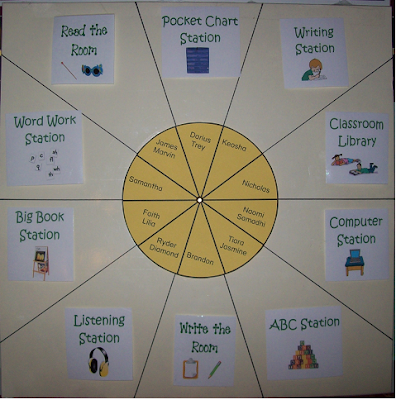 I love your post on literacy stations! I am in the process of moving to VA From Texas! Welcome to Virginia! I see from your blog you're a Navy wife - are you moving to the VA Beach area?